How PC games depict the bomb. Nuclear weapons, other than being a terrible real world threat to our continued existence, are used in games a heck of a lot. Some games treat nuclear weapons as horrific, real and a part of their fiction, while others, mostly strategy games, use them more frivolously. In any case, ever since the end of the Cold War, they've been a fixture of PC gaming when it comes to themes and set pieces. Here, we explore the different ways PC games present nuclear strikes—from the horrifyingly real to, well, whatever Command & Conquer is. 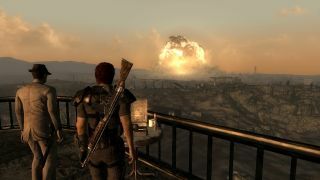 Everyone who played Fallout 3 remembers Megaton, the town built around a nuclear bomb. As a player, you face the choice of deactivating it or blowing it up. I blew it up, mostly because I found Megaton to be a bit of a nightmare to navigate. And I wanted a nice apartment in Tenpenny Tower. And I wanted to see what it looked like when it went off. Is that so bad? Nukes are a mainstay in Civilization, but it was Civ II's nukes that chilled me the most as a young man—mostly because I think that 10-12 is probably the age I worried the most about nuclear war. As an adult, with easy, cheap access to alcohol and many additional things to worry about like property ownership and that persistent pain in my side right now, it doesn't haunt me quite as much. While it's not captured in the video above, it was the air raid siren sound effect that made them particularly scary in Civ II, followed by the skull icons left on the map afterwards. Somehow, moving tanks into the target city afterwards didn't feel like much of a victory, which was probably the point. Metro competes with CoD 4 for the most harrowing moment in this list, and it's one I still remember vividly five years later. You explore a downed plane in Metro's irradiated overworld, and flash back to the moment the nuclear weapons hit Moscow in the game's alternate history, as the bomb's EMP blast takes out a passenger aircraft. It's nasty and all-too-real, but then this is why Metro's world building is so effective.